From left to right: Tim Ryan (Broward County Commissioner), Julie Carson, Justin Flippen, Scott Newton, Keith Blackburn (CEO of the GFL LGBT Chamber of Commerce), Stacy Ritter (President & CEO, GFLCVB), Richard Gray (Vice President, LGBT+ Marketing, GFLCVB), Tom Green, Daniel H. Sohn (Council Member of Town of Haverhill), and Tim Lonergan (City of Oakland Park Mayor). 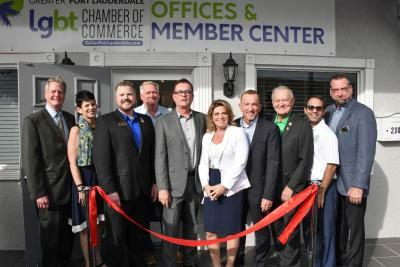 GREATER FORT LAUDERDALE, Fla. – June 15, 2018 – Greater Fort Lauderdale/Broward County opened the area’s first LGBT+ Visitor Center to showcase attractions of interest to LGBT+ visitors. Greater Fort Lauderdale has been popular with the LGBT+ community for decades, welcoming 1.5 million LGBT+ visitors who spend $1.5 billion annually. The Visitor Center is a result of a partnership between the Greater Fort Lauderdale Convention & Visitors Bureau and the Greater Fort Lauderdale LGBT Chamber of Commerce. The new center will be co-located with the Greater Fort Lauderdale LGBT Chamber of Commerce in the heart of Wilton Manors, Broward County’s gay-centric district with the destination’s largest concentration of gay residents and businesses. For more information about the GFLGLCC, or to become a member, please visit www.gogayfortlauderdale.com or contact Keith Blackburn at 954-523-3500 or via email at: Keith@gflglcc.org for media coverage, press kits, membership kits and live interview requests.